This is a quick and simple spell for those of you who are feeling ill, and are asking the higher source for healing. Whether a bad cold or something more dire, this spell should be done every Wednesday until one feels better. and a herb, spice packet. I like to use spinach, a pitch of salt, a pinch of pepper, and herbs that fight bacterial infections like Echinacea and goldensea, also because this is a Wiccan tea, put tea leaves of your choice into the boiling water. Next put in the salt, herbs and spices, into the boiling water, all the while meditating on this being healing and wonderful for your body. 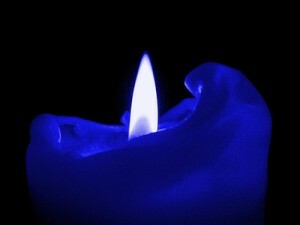 Light the blue candle to the right of the pot and let the tea boil for 5 minutes. After this I would put the tea into a microwaveable container, and drink 4 or so ounces evey 2-4 hours. While I cam down with a sinus infection this January, I was very ill and didn’t have the energy to even move, I made some Wiccan Tea and took a b12 vitamin for energy and felt immediately better.